Replacing the foam in your furniture’s seat cushions is a cost-effective and simple way to prolong its use and make sitting down more comfortable. 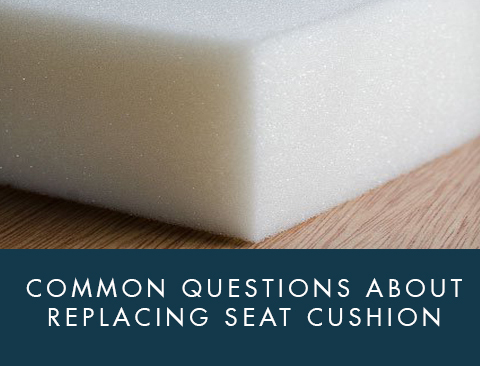 As you look to find the right type of foam for your cushion replacement, you’ll likely have some questions about which product is the correct choice. Here’s a look at some of the most common questions people ask when selecting foam for their seats. Is Cushion Foam Fire Resistant? If you purchase foam for seat cushions in the United States, it must be flame resistant. Foam for cushions has typically been tested by Underwriter’s Laboratory (UL) and have received a Class 2 rating. This means that while the foam is not fire retardant, it will provide a moderate level of resistance to heat and flame before igniting. What Does the ILD of a Foam Material Mean? ILD stands for Indentation Force Deflection and is one of the major ways that the firmness of a foam cushion is tested. A piece of foam that is appropriate for a seat cushion will typically have an ILD of 35LB/ILD to 50LB/ILD. Foam for seat backs can be softer. Eventually, your personal preference for softness and comfort will determine what foam is right for you. Is There a Difference Between the Quality of Foams? 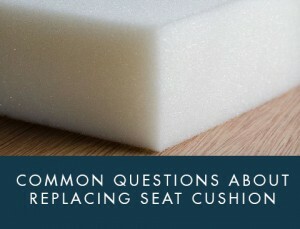 The quality of the foam will play a significant role in determining the comfort level of your replacement seat foam. A lower quality foam will have clumps that make it uncomfortable or could break apart entirely. The Foam Factory, Inc. makes it easy to shop their extensive selection of foam. Their website has many different types of foam products that can be used as seat cushion replacements or mattresses.